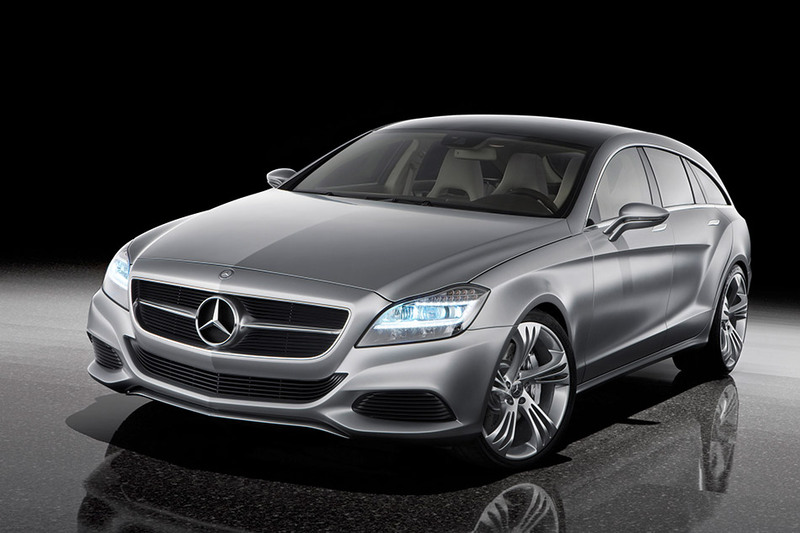 In October 2004 Mercedes-Benz established a new market segment with the four-door Coupé CLS. In September 2008, the brand revealed a fresh and exciting interpretation of the emotionally-appealing Coupé-based design in the form of the Concept FASCINATION. 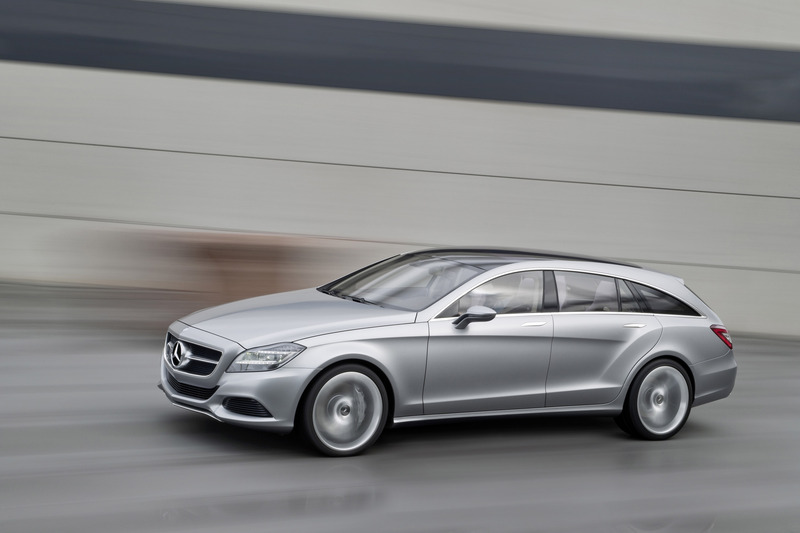 Now making its premiere at Auto China 2010 (Beijing China International Exhibition Centre, 25 April to 2 May 2010) is the Concept Shooting Break - a further insight by Mercedes designers into the possible future development of the Coupé concept. The Concept Shooting Break also represents a clear indication of the further emotional appeal of the Mercedes design idiom. 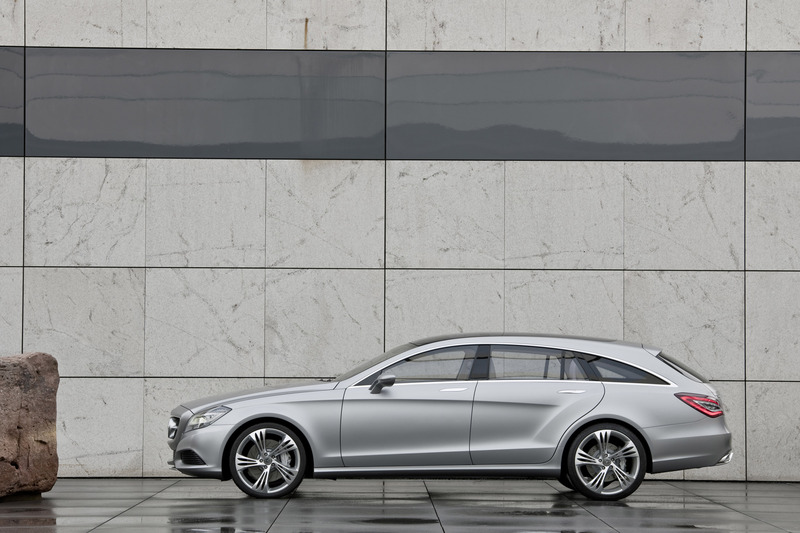 Wide and flat, with a long bonnet and a roof which continues through to the rear: the Concept Shooting Break features some astonishing proportions which at the same time are clearly reminiscent of another design icon - the CLS. The design of the front is completely new, but makes use of elements which are mindful of the SLS AMG super sports car: the radiator grille, with the large star and eye-catching, bionic slats, is not integrated into the bonnet but has been designed separately. The grille is flanked on each side by full LED headlamps, which for the first time feature LED technology for all of the usual dynamic light functions. The side profile is given a touch of dynamism thanks to the high, exaggerated beltline sweeping towards the rear, and the dramatic character line which is supported by the powerful-looking rear wheel arches. The coupé-like side view is also emphasised with a low window design which also highlights the greenhouse with polished aluminium trim. The interior is dominated by natural wood and leather materials. One eye-catching feature is the large full-length centre console. It highlights the four- seat layout as well as the high levels of comfort afforded by the Concept Shooting Break . The wooden floor of the luggage compartment reflects the true interpretation of this area of the vehicle, where the dark-stained silky oak contrasts against inlaid aluminium protective loading strips. The Concept Shooting Break is driven by the forerunner to the forthcoming new V-engine generation from Mercedes-Benz. The V6 benefits from a 60° cylinder angle and a displacement of 3.5 litres, and is characterised by direct injection featuring a control system which enables lean-burn operation. The six-cylinder engine produces 225 kW (306 hp) with a maximum torque of 370 Nm and in line with the BlueEFFICIENCY criteria of Mercedes-Benz also sets new standards among the competition in terms of fuel consumption. The proportions are clearly those of a coupé: the long bonnet, narrow-look windows with frameless side windows, and dynamic roof sloping back towards the rear create a basic stance with which it looks ready for the off. 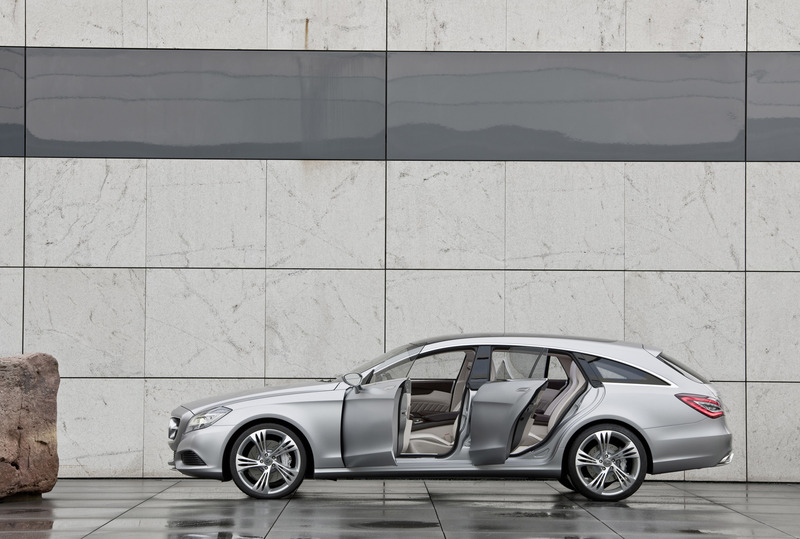 It is only when taking a second look that it becomes clear that the Concept Shooting Break actually has four doors and an estate rear. 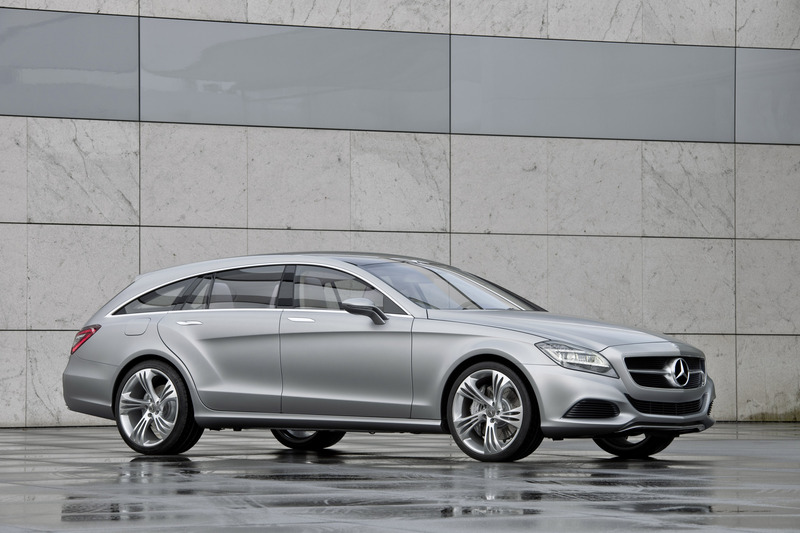 As such, this study in design reveals its philosophical links with the four-door CLS Coupé, a car which has established a new market segment since 2004 and today is already seen as a design icon which is likely to occupy a very special place in the history of the motor car. The Concept Shooting Break may well be looked back on at some point as having played a similar role, taking ideas from the Concept FASCINATION premiered in 2008 and projecting them into the future. "The Concept Shooting Break is based on the great tradition of a stylish, cultivated sportiness which has always characterised the great Mercedes Coupés, and it takes this unique legacy an exciting step further", explains Professor Gorden Wagener, chief designer at Mercedes-Benz. 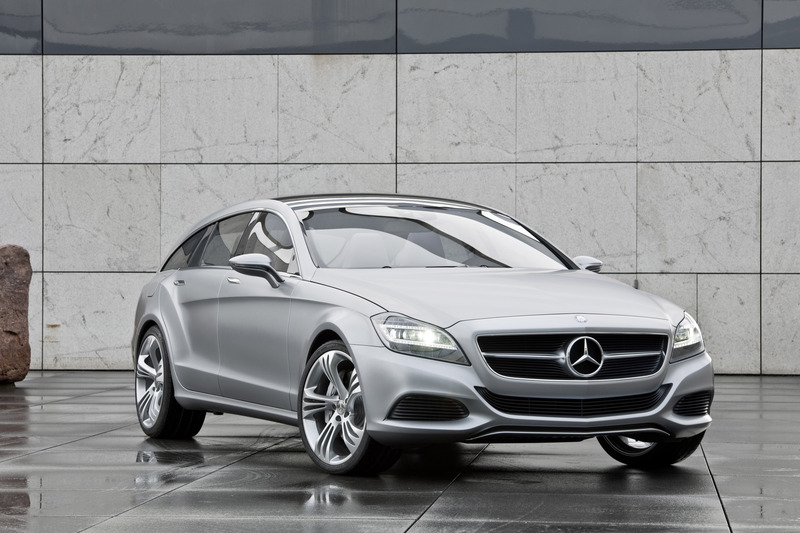 "At the same time it points the way towards the future design idiom of Mercedes-Benz." The vocabulary of the design idiom includes the contrasting play between lines and exaggerated areas, which combine to create an animated area of interaction. The expressive design of the front immediately catches the eye, using elements which are mindful of the SLS AMG super sports car, and with a radiator grille which is not integrated into the bonnet. This contributes to better pedestrian protection and at the same time also helps to improve the focus on the long, sporty bonnet. 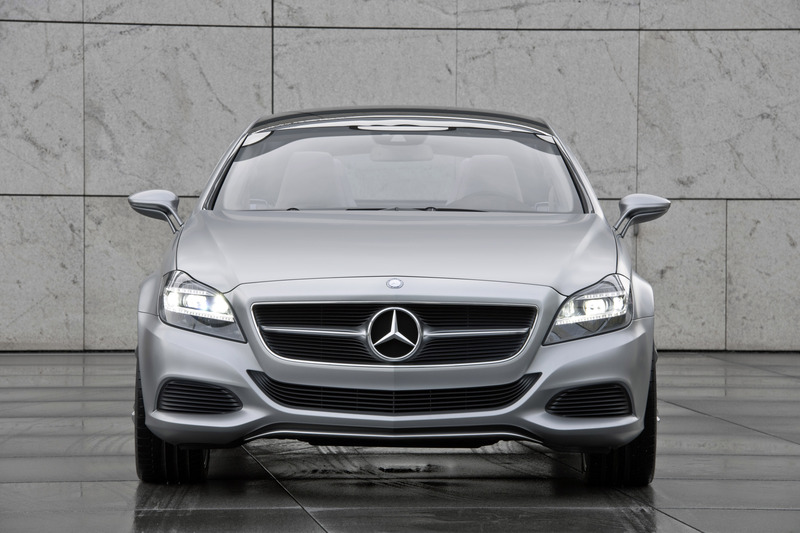 The grille is dominated by the large central star, highlighting its relationship to the other Coupés of the Mercedes brand. It is supported by bionic, curved grille slats. Their curved design is reflected in the expressive look of the front apron and air intakes. Particularly eye-catching are the full LED headlamps, which for the first time offer all of the regular dynamic light functions using LED technology. Inside they are divided into three arrow-shaped layers from top to bottom: the upper layer contains an LED indicator, beneath which is a striking LED side light offering LED low beam functions. The side light can also be seen when the dipped beam function is switched on, thereby creating a novel and separate night-time design and distinctive look. The lowest level of the headlamp houses the main beam and nightview functions. A total of 71 LEDs not only provide an unmistakable appearance, but also a significantly enhanced view of the road compared with previous systems. The side profile of the Concept Shooting Break is dominated by the low, frameless side windows, the coupé-like shape of which is further highlighted with the incorporation of a polished aluminium frame along the body. Thanks to the positioning of the outside mirrors on the beltline, the side line is emphasised and all-round visibility has been improved in the region of the A-pillars. 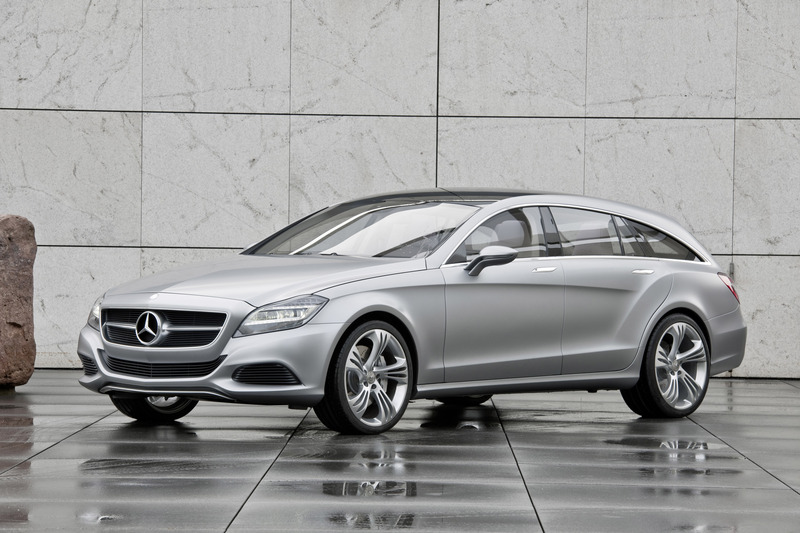 The side windows are supported on a high beltline, which slopes towards the rear in a fresh interpretation of the classic "dropping line" of iconic Mercedes Coupés. An additional exciting touch has been made with the prominent, muscular hip points which forcefully support the side line. This interaction gives the impression of a sprinter, poised in the starting blocks, ready to release an explosive forward surge of energy. 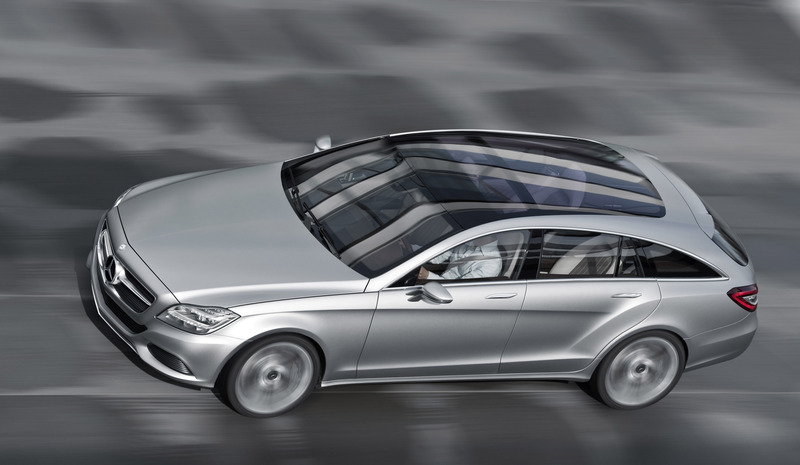 The roof follows through to the rear and also drops away in typical coupé fashion. Another special feature is the recessed, filigree door handles, which emerge on being touched with the aid of sensors to allow access to the interior. The side view is rounded off with wide wrap-around tail lights featuring LED technology. 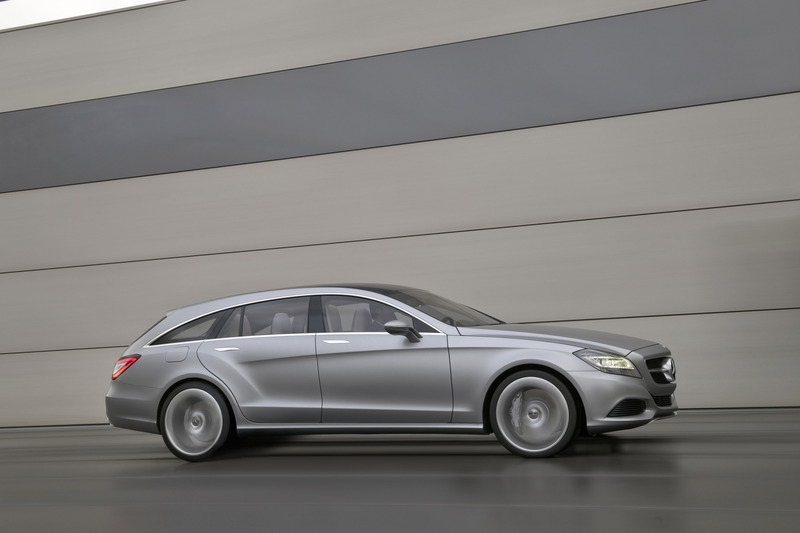 As such they form a linking element to the low, steeply-angled estate car rear end with top-hinged tailgate. The shape is emphasised by the broad shoulder line, which is clearly visible from behind and supports the lowered-look greenhouse. The twin pipe exhaust system, with two polished exhaust covers, is integrated into the rear bumper, which features an elegantly curved wing. Also contributing to the special appearance of the Concept Shooting Break is the exceptional paint finish. A satin-finish clear coat has been used, which gives the vehicle's allanite grey magno colour a mysterious glint and also further brings out the Coupé's exquisite lines. The sporty look of the Concept Shooting Break is complemented with large 20-inch sterling silver wheels, featuring a special bionically arranged five-spoke filigree design. They allow a glimpse of the large brake discs behind. The front wheels are fitted with 255/30 ZR 20 tyres, while the rear of this exceptional vehicle sits on 285/25 ZR 20 tyres. A large panoramic glass sunroof provides a glimpse into the high-quality, perfectly hand-crafted interior of the Concept Shooting Break, where natural materials such as wood and leather dominate. Wood is used on the trim elements and door pulls, the instrument panel and centre console, and primarily on the luggage compartment floor in the rear. When it came to choosing the wood, the interior designers opted for silky oak on account of its unusual, lens-shaped texture. The wooden floor in the luggage compartment has inlaid aluminium protective loading strips, and is reminiscent of finishes normally seen in yacht building. Four saddle bags along the sides of the luggage compartment are useful for storing small tools. They are finished in leather, a material which has been used extensively throughout the Concept Shooting Break: in fact, almost ten square metres of leather have been incorporated into the interior. Light sections of porcelain-coloured nappa leather form an attractive contrast to the dark-brown natural-coloured aniline leather and perforated metallic-silver finish seat cushions and door centre panels. Extensive double-lapped stitching and discerning colour-coordinated upholstery seat piping reflect the hand-crafted perfection and attention to detail, as does the tuck stitching on the instrument panel, door sill covers and seat backrests, all of which highlights the contours of the components extremely well. Perfection and attention to detail also apply to the trim elements. While on the exterior they are polished to a high-sheen finish, in the interior they feature a matt finish. A total of seven manual processes are necessary – from grinding to polishing - to transform the components, which are milled completely from aluminium, into their final decorative form. The matt finish of the interior trim has also served as inspiration for the metallic-silver leather on the seats, door centre panels and bags in the luggage compartment. The deep-pile carpet in the footwell – finished in porcelain colour – is a luxurious material used by Maybach-Manufaktur. The light-coloured roof liner made of silk cloth adds the finishing touch to the impression of comfortable elegance in the interior. The Concept Shooting Break is clearly a four-seater. The four identically shaped leather seats have a touch of the sports car about them thanks to their integrated head restraints. Openings in the upper area of the backrests make it possible to see through the seats. A large full-length wood console on the transmission tunnel provides a visual divide between driver and front passenger and at the same time indulges the occupants with two large leather-covered armrests. It also houses two cup holders as well as controls for the rear-compartment air conditioning. The centre console is finished off at the rear with inlaid work: curved Mercedes lettering which harks back to the style of the 1920s. The striking cursive-script lettering is also repeated on the front door sills. Since the central screen has been integrated into the upper part of the instrument panel, the cockpit has a "wrap-around" effect. The elegant verve and bionic details of the exterior are captured, among other things, in the dynamic wave-design air vents in the instrument panel. An analogue clock sits in the centre. The instrument cluster comprises three tubes for dial-type gauges as well as a colour display for service indications. The Concept Shooting Break has dynamic full LED headlamps, which combine the exciting daylight colour impression of LED technology with the performance, functionality and energy efficiency of today's bi-xenon light generation. The new light system, due to make its debut in series production this year, features the Intelligent Light System which has already been tried and tested in Mercedes models with bi-xenon headlamps. Its five light functions – country lights, motorway lights, enhanced fog lights, active curve lights and cornering lights – have been specifically designed for typical driving or weather conditions. The light specialists at Mercedes-Benz have also been able to combine LED technology with the innovative Adaptive Highbeam Assist for the first time, leading to a completely new level of safety at night. The Concept Shooting Break is driven by the forerunner to the forthcoming new V-engine generation from Mercedes-Benz. The special features of the spray-guided direct injection engine include the latest generation of piezo-electric injection valves which enable multiple injections. Better lean operation is possible thanks to load monitoring of the pressure information. Even the operation of the ancillary components has been made efficient and there is also a start/stop function. The V6 with a 60° cylinder angle and displacement of 3.5 litres produces 225 kW (306 hp) with a maximum torque of 370 Nm. or the homonym Brake, was the name once given to carriages used to "break" in wild horses and also to restrict (or "brake") their urge to move, so that they could be put to use as work horses. Since the carts could easily be broken as part of this process, people tended not to use ones which they may have urgently needed for other purposes. Where necessary, "Brakes" were often fitted out with variable bodies, which were only really used to carry along anything that may have been necessary for the hunt, for example. Any such vehicle which was used when going out shooting was called a Shooting Brake or Shooting Break. In the 1960s and 1970s motorised Shooting Breaks were popular in Great Britain – exclusive cross-over vehicles, which combined the luxuriousness of a coupé with the luggage space of an estate.